From the Dust on Patreon! If anyone still reads this blog ... know that From the Dust is out of hibernation and now on Patreon.com! You can now read for free at FromtheDust.net. On another side note, this blog is now officially being retired so please follow updates on From the Dust's Facebook page or of course by becoming a Patron on From the Dust's Patreon page. In celebration of General Conference a few great LDS bloggers around the world have brought some great freebies to enjoy as we help you "strengthen home and family." From you can get a free digital issue of From the Dust - The Book of Mormon Comic. Once you are finished downloading this awesome book, go to Brightly Street to pick up your next freebie about General Conference along the LDS Blog Train. Guess what?! This blog is being discontinued. We've loved our 2+ years on here but now we have our own integrated blog on the new website that just launched! Subscribe to us over there using the links below! Thanks for being so loyal to this blog. We know you're going to love the new look. Justin Thomas won a copy of From the Dust #1 this week! Congratulations Justin! To claim your prize, just message the From the Dust Facebook page with your mailing address and we'll get it sent out to you! A couple of weeks ago I launched the From the Dust Kickstarter Crowdfunding Campaign. The campaign is all-or-nothing. If I do not reach $14,000 by Christmas Day I will get none of the money that has been pledged and From the Dust may not be able to accomplish its ambitious goals. For a broad view of what I am trying to accomplish, please read this interview by Ben Crowder of MormonArtist.net. The nutshell of the interview says that the LDS industry doesn’t create family media, but rather creates targeted media for independent demographics (teen books for teens, Mom books for mom, dad books for dad, kids books for kids, virtually nothing that we can share together like a Disney film.) It also states that I am capable of providing that family media and that it is needed now more than ever - especially internationally. My work is different, it’s innovative, and it requires the opening of the minds of Latter-day Saints to a new medium for family media besides TV series and movies. This “new” medium is the comic book series, reinvented for the next generation of Latter-day Saints. The comic book allows me to provide Disney-quality entertainment at a fraction of the cost. In addition, unlike TV and movies, this entertainment can be translated inexpensively and distributed to families all over the world via the Internet. Comics are the most effective medium to accomplish this. I already have my first issue in Spanish and Portuguese, which covers 85% of LDS Church membership. It will be published for free online in January as a service to the 8.5 million Latter-day Saints that don’t speak English and the over 18,000 international fans of my Facebook page. Aside from the artwork, the project is founded upon sound and sustainable business practices, but I do not have the funds in its early stages to get it off the ground. Ultimately, I will need about 4-6 issues published before it become self-sustaining. Until then, I have to get creative to make the project a reality. "We needed LDS media in our own language yesterday. Not in two years. Not in one year. We need it NOW! We're starving out here for quality material and America isn't producing anything that we can use!" Jenni Floyd is our winner this week! Congratulations on winning a copy of From the Dust #1: The Last King of Judah, 107 pages of educational greatness! To claim your prize please contact us using private messages on Facebook and send us your mailing address. If you haven't heard, I'm KICKSTARTING #2! Kickstarter helps me out a ton because if we can raise enough funds I can publish issue #2! I'm working on finishing it now. I've promised my fans I would have it for them by Christmas and I'm working very hard to make that happen. CLICK THIS LINK TO WATCH THE VIDEO! In this panel of From the Dust #2, Jeremiah blesses baby Nephi. Their faith calls down the powers of heaven. Michael Shelton won our Fan Friday this week! He got a copy of From the Dust #1! Congrats Michael! Congratulations to Courtney Roberson for winning this week's Fan Friday! She won a "Hope Whispers" poster, 19" x 27" of awesome! How to claim your prize: Just message us on the From the Dust Facebook page with your mailing address and we will ship it out! Fan Friday winner is Reyes Tomas who won a copy of From the Dust #1 ($14.99 value). 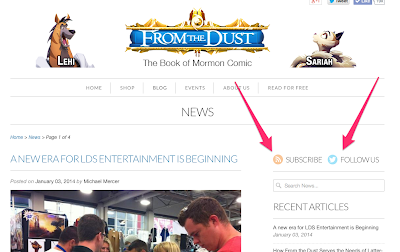 How to claim your prize: message the From the Dust page directly on Facebook (www.Facebook.com/bookofmormoncomic) and provide us your shipping address. Congratulations! We had our first winner - Taylor Dracorex Shields! She won a First Fan Kit. Only about 30 left. New Fan Friday! Easier, Better..! It's no longer based on email subscription, but rather participation on our Facebook page. One winner is chosen each Friday from fans that have Liked AND Commented ANY From the Dust Facebook post that week. Each Liked AND Commented post represents one entry in the contest. Multiple entries during a week are possible and encouraged. Go here for official rules. (yeah we have that now! Another thing that we found was important). I like starting with good news, don't you? I've got interns now at BYU helping me out. They're all trained. That took some time. They help with inking and painting my drawings. I will introduce them if they stick around, which I hope they do! I'm starting to get the business financials in order. That may not be a big deal to you, but it is if I want to survive my first year! 90% of small businesses fail in their first year. I'm not going to be one of them! If I make it to February 1, 2014 (and I WILL!) then I'll officially have gotten through my first year! Feb 1 is when I published From the Dust #1. At that time From the Dust had just 250 likes on Facebook! Now she has over 18,000!! I'm hard at work on #2 and it's looking great! See? Don't worry it will be full-color! These are just the pencils/inks. I failed on Fan Friday. We haven't had a winner in weeks! But I'm fixing it with the next post! I failed on Inktober. I have about 5 more sketches to do and others to scan and post. Will do so soon! I finish what I start! Just late sometimes. There is no ugly! Except this guy. Mosey on over to our new Tumblr and see more Inktober sketches! No erasing. No color. No digital editing of any kind. Pure ink! I feel this kind of drawing is the "true test of manhood" for an artist. Our Brand-Spanking-New Tumblr hosts all our Inktober images! Here's just a sampling. Another one coming tonight at about 7pm! Just as Lehi or Nephi would have looked to Jeremiah as the living prophet of their day for guidance, we look to living prophets today. , and a lot of my other friends! "I wanted to take a minute to tell you how I have felt since talking to you. Libby and I stopped and looked out over the room one last time on our way out and we are just so impressed at the glorious creativity mankind has inherited from our Creator. There was such an amazing positive feeling throughout the entire gathering that even the things that might have seemed vulgar or morbid just seemed like another expression of the miraculous power of the human mind and the human spirit. I was amazed, delighted, touched, and soothed by much of what I saw yesterday, but I wanted to let you know that none of it was more inspired or inspirational to me as your little booth and the spirit you carried as you genuinely try to bless the lives of your customers. I have seen many LDS media projects from Living Scriptures to BYU Television over the years, and I find your approach to be carefully considered and carefully executed. I predict we will see it's effects far and wide. To be honest, it felt almost like your project was the whole reason the first SLC Comic Con happened when it did. I predict this Comic Con is a step towards a new age of LDS media and the public's view of the Church in the media..."
"I wanted to say how nice it was to meet you and how impressed I was with your Comic. I read it all the way through on the way back home to Idaho Falls and the only disappointment I had was that it ended!! So get busy buddy cuz I can't wait for the next one!! It's worse than waiting for a movie I'm dying to see. I LOVED LOVED LOVED IT!! I really loved all the extra education you add. It's such an informative and fun way to educate about the scriptures and I'm so enthralled with the history. I love history and the scriptures but to see it from your unique, fun way, it made it so much more enjoyable. I'm showing it to all my friends!! I love the animals and your art. One thing I can't figure out is what animal Lehi and Laman are. I can see that the rest of the family are cats but maybe you can enlighten me. (We've had family discussions on this one). So, thank you Michael for sharing your amazing talent for art, and writing, and for giving people such a delightful way to read these incredible powerful stories. (At times, Scriptures can be boring all by themselves you know). I'm so grateful for people like you in this world!" The stunning art work of Mike Mercer from Spider Comics was one of the most attractive booths out there. From bright colors and amazing design, From the Dust is more than impressive, regardless of the genre or subject. Seriously, even if you don't care about religion or Biblical topics, Mike's talent is a force that has to be seen to believed. Debuting in both print form and iPad app, this series is a breakthrough in more ways than one. Plus, Mike is a super cool guy running a one man show! Over $150 worth of merchandise given away at Comic Con! We gave away 6 First Fan Kits on the last day of Salt Lake Comic Con! Here is the Jensen family - they're a little excited! They said it "made their day!" The Jensen Family won a free First Fan Kit at Comic Con! So did 5 other families. Just a few prints left! After that any remaining prints will be burned! I only have about 40 prints left, so just a few of each image. $8 for 8x10s. Buy 3 and get one free! Each print has the special SLCC 2013 (Salt Lake Comic Con 2013) seal! Only about 200 total prints made. 400 books sold Comic Con! We thrashed our sales goals! I hate worrying about business stuff, but it's necessary if you want to stay in business! We had a goal of 300 books sold and we blew it out of the water! Over 400 sold averaging a book every 3.5 minutes. That's about as fast we could talk!! Me and my friend Griffin. He runs a dance venue in Provo @ Enliten Bakery & Cafe on Friday nights. Ronita with Jack! Ronita is good with money. I am not. The amazing duo - er - trio: Matt, Gollum, and Maria! Me talking to a crowd of superheroes. We sold an average of a book every 3.5 minutes. Better picture of the booth coming soon! We had a pro photographer friend drop by and take some. Yes that is a dinosaur walking down the aisle folks!